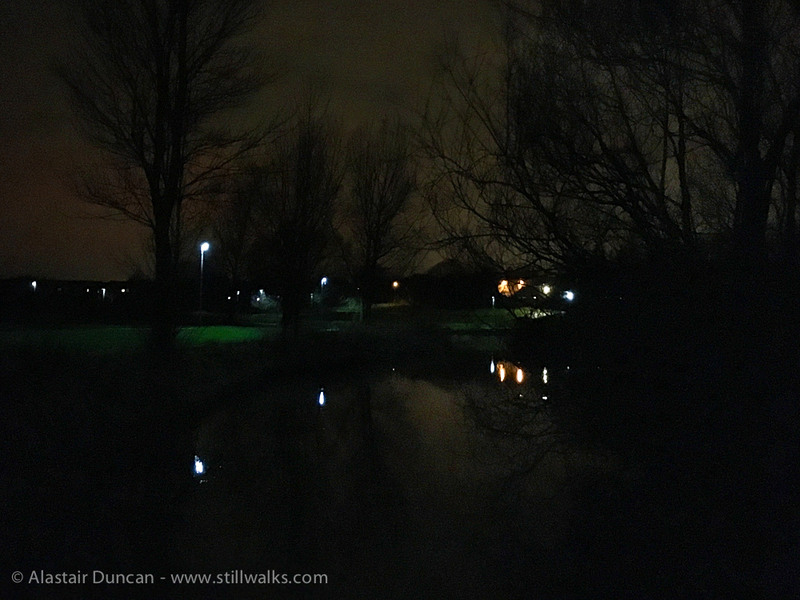 As my walk extended round to the unlit side of Hemlington Lake my photos became still darker. At this point I am facing away from the town and much of the light and colour reflected on the clouds is hidden by the trees behind me. 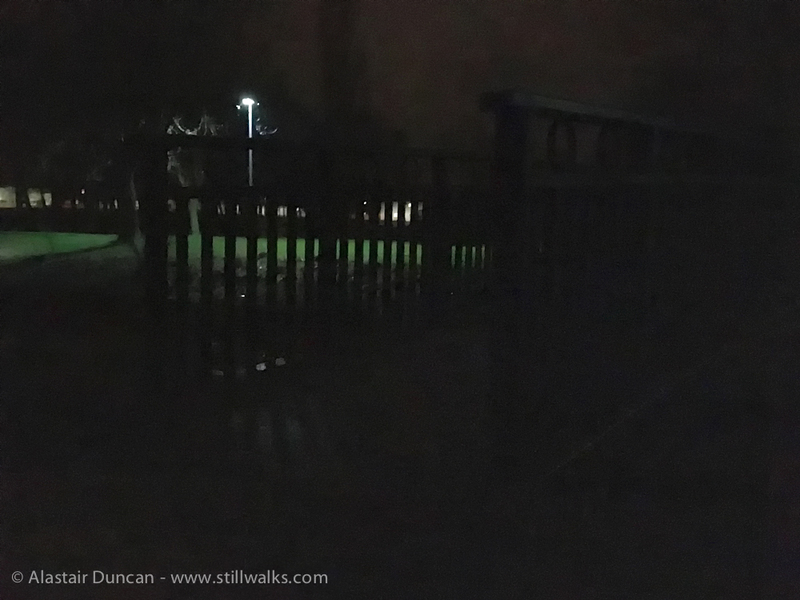 In the first image you can just see the near side of the footbridge with the railings of its far side silhouetted against the street light. Below is a short sound clip of my footsteps crossing the bridge and it is after this that a gentle rain starts. 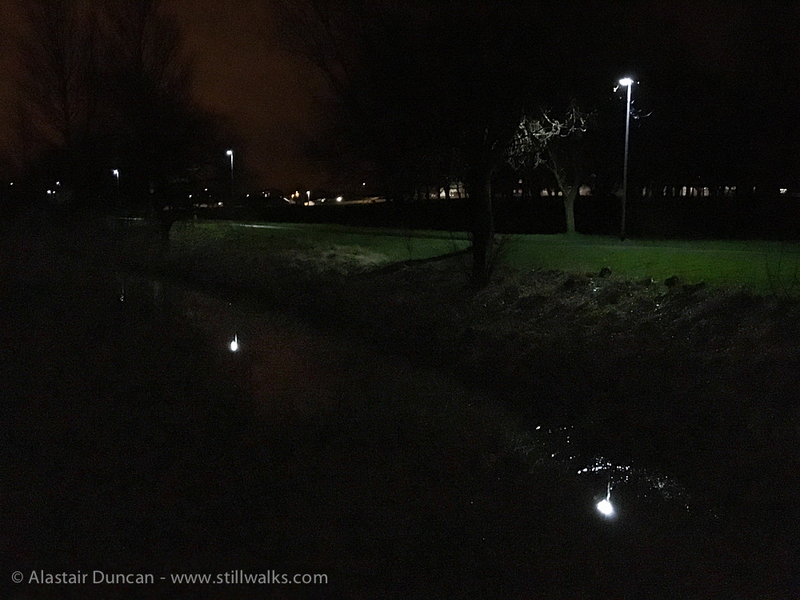 Posted in Field Recording, iPhonography, Urban, Walks and tagged dark, field recording, footbridge, footsteps, Hemlington Lake, night, night walks, rain, silhouette, urban walks, walks. I still love the sound of the bridge but it feels more muffled and distant this time. Where you more careful as you walked or was it the rain muffling the sound? Hi Allysse, I’m pleased you still like this sound. There are a number of reasons my footsteps sound different in this more recent recording. Atmospheric and ambient conditions account for them all – although the recording was made at the same time of year, weather conditions were different. The daytime walk shows no ice and so the temperature must have been fairly mild for the time of year, however, I have never known as mild a winter as this one has been (up until the last couple of days). The daytime walk also took place on a dry day whereas the night time walk was damp and at the time of crossing the footbridge, raining. Also, being a night time walk, this too will affect the quality of sound you hear – although we typically expect sound to be clearer at night, what you hear is still dependent on all other conditions. The boots I was wearing were not the same as those I was wearing on the daytime walk and may have a softer rubber sole. I think the specific atmospheric conditions, the moisture in the air and rain are probably the most important factors but all elements need to be taken into consideration. This is why it is important for me to always do the field recording for a StillWalks video at the same time as the photography – the sound is unique to the time and place and must fit correctly with the images. I love the intricacies and subtlety of our sensory perceptions! The sounds are a lovely compliment to the beautiful photos. Thank you!